The Eco-gecko sustainable 10" square palm leaf plate is an environmentally-friendly way to serve your culinary creations in a variety of venues. All Eco-gecko products are 100% natural, biodegradable, and compostable, and are an excellent, eco-friendly substitute for products made from foam and plastic! Each 10" plate is made out of renewable fallen palm leaves! In addition to its natural beauty, this material breaks down quickly in landfills and composters for further recycling of a great natural resource. The plate is extremely strong but still meant for one use, so it is completely disposable. I ordered these plates for a small, at home wedding. I wanted an eco-friendly option, but didn’t want to deal with washing dishes. These plates were perfect! They are very beautiful and sturdy. They are also a very generous size. Friends and family were certainly able to pile up their plates! A handful of the plates were left over from the wedding, and we used them at home afterwards. They held up very well to being washed and reused. Overall, I think this is a great product and would highly recommend them to anyone. We use these plates for catering. Our customers always comment on the beautiful appearance and love the fact that they are compostable and all natural. Love, love , love these palm leaf plates. The size of the plate is great. Holds a good amount of food. These plates are also attractive! A plus!! Ordered these in 100 pack and got this extra 25 to fit my needs. Plates are perfect size and width. Very satisfied with the purchase. Our guests always love these plates and think they are reusable. We use them for a lot of formal events including weddings. They are one of my favorite products, ever! Great for beach themed events. However a word to the wise is to keep them covered in an airtight container on damp days and they do not hold up well for pre-plating. Bought these as a cost-effective and eco-friendly option for our wedding. They held up well to the wet/juicy items, as well as using a knife to cut the steaks. They were solid, and pretty to look at, and made clean up super simple! Do plan on purchasing more in the future for entertaining! I get rave reviews from catering clients all of the time because we use these elegant palm leaf plates for our disposable catering serveware. They're very sturdy so guests can pile on the food and liquid won't soak through like with some other compostable products. These palm leaf plates are a fun yet eco friendly way to go!! They are a very sturdy plate as well, and offered at a great price! These are much nicer than paper plates. They hold up well, are eco friendly and are light weight.They are a great way to bring the outdoors in! What's not to like about these? They added a beautiful, natural element for our tablescapes. They're designed with durability and the natural color variations add visual interest. Loved them! Great size for a luncheon or dinner plate. We appreciate your review, Michael! If you are looking for a different product that will better suit your needs, please contact our Customer Solutions team. Elegant rustic is,our the,e for the reception. these woodsy looking plates will look great with the white cloth table coverings and the mason jar glasses to pull off this unique look. I purchased these for my own wedding. I have since used them at multiple events. They can be as elegant or as simple as you would like. They were very sturdy and held up under the weight of large quantities of food. These are really cool plates for a casual gathering. We originally wanted to use it for our wedding but it was too rough and we decided to do something nicer. Pretty unique plates though! Soooo happy with this product, you can even wash it and re-use it, the quality is very good. Recommend it, do not hesitate to buy it. I love these plates. I have used it many times for private parties and everyone loves them. They are always asking me where I got these. Very sturdy and holds up well. They initially have woodsy for but I just let them out of the plastic and leave them out. I have the 10, 8, and 6 inch in stock at all times now. The Eco-gecko 10" Sqaure Palm Leaf Plate is a great alternative to traditional disposable plates. The price is a bit more per plate but our customers are usually willing to spend the added expense for the sustainable and great looking plates. Used these for my "woodsy" themed wedding to compliment my decor. We served a buffet of chicken and warm sides and these plates were large and sturdy. Eco friendly factor also played into my decision. These are a great alternative to the plastic that I've used in the past. They can hold heavy foods and are very attractive to have. The best disposable product on the market. Holds hot and cold like it was a real plate, and the cost is great. Will use again and again. I HIGHLY recommend these plates!! Not only do they have great aesthetics, but they are durable! I love that each plate differs a little bit in coloring due to the natural leaves. These are great for weddings, outdoor picnics or barbeques, or just an alternative to paper plates! LOVE these plates! We used these at our wedding because we wanted a compostable product, and they held up really nicely. They were sturdy and withstood saucy foods without any leaking or breakage. They look lovely as well, and we received lots of compliments on them. Several people were surprised that they were "disposable." They thought they were "real" plates. We definitely recommend this product! I wasn't sure what to expect when purchasing these but these are perfect! I bought these for an outdoor wedding and I am so excited to use them. They are the perfect size for a dinner plate and thicker than I expected. Now I can have disposable without sacrificing quality. These plates were used at a birthday party. I received so many compliments and was asked where I found them. Definitely a unique and unexpected item. They worked well for all the salads, pastas, and sandwich dishes we served. I would definitely recommend them to others and I will use them again. Great, sturdy plate and love the fact that they are eco-friendly. They are right at home at a BBQ or can even be dressed up for a more formal occasion. So much better than trying to use plastic plates and you don't sacrifice any quality. Wow! Beautiful design and durable! Perfect for our upcoming summer wedding! Best price around for the quantity needed.. The fact that these are biodegradable make them much more desirable to me. These plates are gorgeous. Each one is unique, and they look very earthy yet elegant. They seem sturdy and have so far survived a few regular dinner meals. Have not tried anything too soppy/wet with a lot of gravy, so not so sure how they will hold up to it. But along with the wooden birch utensils, and simple white napkins, this makes for a stylish yet eco-friendly presentation for a sit-down dinner. I especially love that I can use to for my husband's 50th birthday party and it will strike the perfect balance between being casual and macho, while allowing flowers and candles to soften the effect. Everyone who sees these plates wants to know where I got them! They are disposable, but I have been able to wash and reuse them for home use - as long as they didn't have something like salad dressing on them. Such a great find! These are a fantastic alternative to paper plates! I used them for my country style backyard wedding and everyone was tickled with them. They are sturdier than almost any paper plates and biodegradable, so clean up was guilt free! I would absolutely recommend these to anyone for a picnic style or outdoor event! These plates are SO COOL. I got them for 2 reasons. 1) I hate doing dishes at my house but I don't want the low end feel of styrofoam or paper plates. 2) For my business so me and my employees could eat here and not worry about managing them on dishes. PLUS the same effect as above, its still retains that cool feel over low end reusable products. PRO TIP: You can reuse the plate once or twice if the food isn't too messy. These things are freaking awesome. We use them to build small take away platters, catered events and pretty much anything else that happens off premises. The customers love them because they are sturdy and can be composted. These thing are just a flat out win. These plates are great. If you're looking for a disposable option that really looks great, I highly recommend them. They looked very nice in a place setting for a dinner party. I love these plates. I use them for everything. Guests are always so happy with the size, durability and look of the bamboo plates. My staff love them because they are disposable. Very nice quality. I love these plates and products. Rigid and sturdy and quite the conversation piece. Had them at my holiday party and everyone wanted to take them home. They are all natural, so it jives well with my eco-friendly spouse. Since they are not manufactured like other plates, you occasionally get one that is split or won't hold it's shape. They're all different. Never using plastic again. These are great for a rustic and/or outdoor event. They are sturdy, and have a natural design and texture about them. Several of our brides just went gaga over them. Reasonably priced for another option for the rustic setting. The perfect item to showcase your client's eco-friendliness. I used them for a wedding and they held up well and fit in their price range. They also add a nice touch of nature to the table and can be dressed up or left casual. These plates surpassed my expectations! The quality is higher than I expected which is great since they are going to be used for a rustic wedding. The plates have a great array of markings and colors varying from light to dark shades. I was worried when reading other reviews that the plates were going to be to bend or not be able to hold anything heavier than salad but this is not the case. I will note that the lighter areas/plates are thicker/stronger than the darker markings. The overall impression of the plates is great and I will recommend these gorgeous plates to anyone! These plates are great. They're durable, light weight, stylish, and everything else I was looking for. I order them regularly in bulk, which saves us a ton of time and they're always a great price. Whenever possible I recommend that clients use eco friendly materials at parties. Not only are the Eco Gecko plates compostable, they are pretty and durable too. So much nicer than paper or plastic! I love these plates ! Very sturdy and durable ! They make for a great rustic event and are the talk of the town when we use them for catering events ! These plates are perfect for any party that you want durable, great looking yet disposable! I can't wait to use them for our wedding! Love them! Very impressed with this product. I just ordered it for my September wedding and it fits perfectly with the rustic-chic theme! Not only do they have a purpose, but they also add to the decor of the reception! Although the product is made from palm leaves, it is much sturdier than expected! The Eco-gecko 10" square palm leaf plates are very sturdy plates that have the added benefit of being eco friendly. They are also very unique and will work great for our upcoming luau. I first ordered these as samples to see if I would like them for my wedding, and sure enough I loved them and ordered 100 more. My cousin also decided to use these for her wedding and everyone loved them! Not only are they fancier than paper or plastic plates but the are eco-friendly! Great product! I ordered these dinner plates for my daughters barn wedding in July 2015. I am very impressed of the sturdiness and the look of these plates. These plates are fantastic! We used these at our wedding, and they were definitely a conversation piece. Everyone loved how they looked, and they loved that they were an environmentally friendly alternative to plastic plates. The plates are pretty sturdy, and have enough of a lip to hold food and liquids on the plate. The plates have splits, some of the edges are missing. Some edges are so thin, the plate actually broke out your hand. Very unhappy. First time I ever received a product I couldn't. Very disappointed. Thank you for your review! We are sorry to hear that the plates you purchased are breaking. 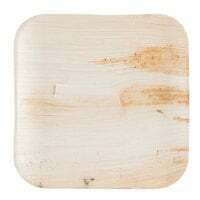 We recommend Bambu’s Disposable Square Bamboo Plates for a heavier duty plate. These are awesome looking plates! Purchased for my daughters country themed wedding and we were so happy to find compostable solutions through this site. This was only the sample purchase, more is to come! Thank you and shipping was fast! And we have already shared these options with friends. ordered these for our outdoor beach wedding and they are perfect!!! will match our decor and are sturdy. Very unique much better than other choices we considered.